1. Finely dice the Onion, then and add it to a large non-stick pot with a splash of Vegetable Broth. Sauté the Onion and Vegetable Broth together over medium-high heat. Sauté the Onions as you normally would in the pan, but let all of the Vegetable Broth evaporate. Let the Onions “sit” in the pan for 10-20 seconds without liquid, then “deglaze” the pan using a splash of Vegetable Broth. Repeat this process until all of the Vegetable Broth has been used, and the Onions are tender and dark brown. 2. Add 1/2 cup of the Caramelized Onions to the blender with the Soaked Cashews, Tofu, Garlic Powder, Nutritional Yeast, Worcestershire Sauce, and Salt. Blend everything until smooth and creamy, then transfer into a bowl and fold in the remaining Caramelized Onions. 3. Place the dip in the fridge for at least 10 minutes, to allow it to thicken and set. 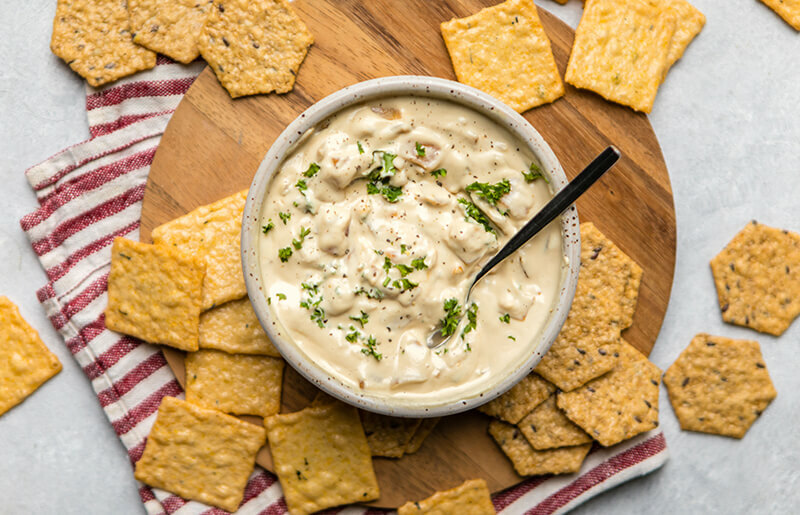 Top with fresh Parsley and Black Pepper, and serve with Crunchmaster® Crackers. Leftovers will last in the fridge for up to 10 days.